I recently moved into a new apartment that has huge built in shelves in the bathroom. I thought about using them just for my linens but decided to make them a bit more girly by making use of some of the items I've purchased for shoots. The first theme I decided to do was roses because I secretly adore the color pink. I also received an amazing Chloe perfume set for Christmas and their bottles designs are meant to be displayed. After a trying year I've been focused on finding ways to calm my mind, create a sense of peace and have feel good vibes so while I always liked the scent of roses, I started to like it even more when I read about how great it was for the senses. It aids in depression by boosting self esteem and help relieve anxiety and i's a great aphrodisiac--trust me, I know. 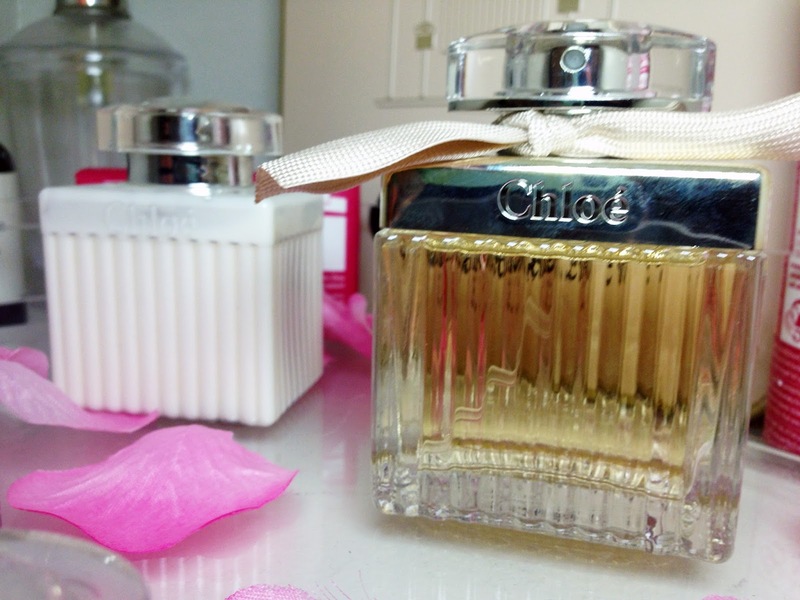 Wearing my Chloe perfume drove my last boyfriend nuts! With all of that it's only natural that I want at least one room in my apartment to be dedicated to subconsciously making me feel good even though I'm never there for more than 30 minutes at a time. 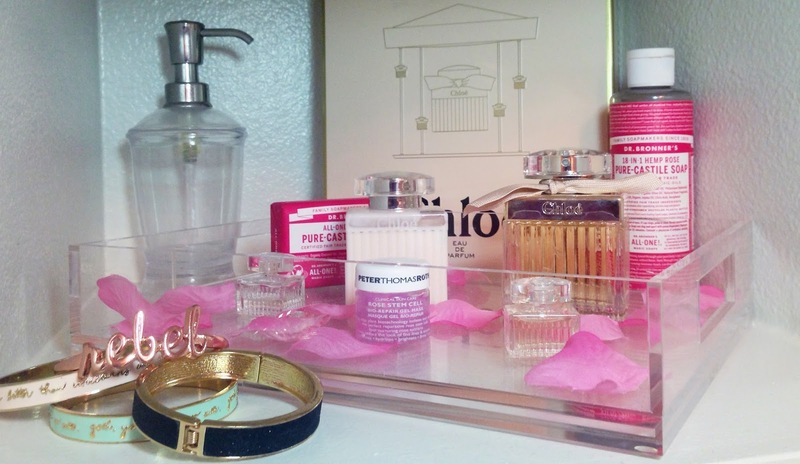 And not only does the essence of roses make my mind feel great but I absolutely adore walking into my bathroom and looking at my perfect little shelf. Here's what I was able to get in order to put this shelf together. I received a lucite tray a few months ago and thought it was just what I needed to take great photos and I was right. I was finally able to get the perfect white, or any color background that I wanted for my shoots. But once I got my light box I didn't need it anymore and thought it would be a great way to display my favorite products. 2. Artificial Rose Petals- Over the summer I had a great idea for a post on scents and bought rose petals for a video that has yet to be properly edited-whoops! Anyway, I'm not sure if I will ever use these again so I didn't know what to do with them but I know that I can't have these tucked away because I'll forget about them. 3. 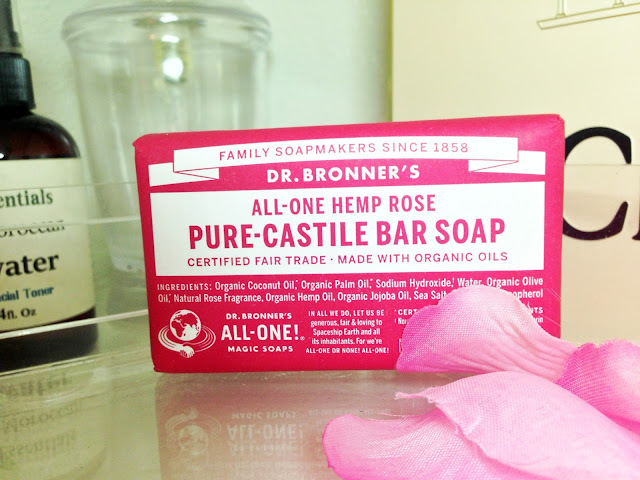 Dr. Bronner's Castile Soap- I've touted this brand before and I will do it again. I'm in love with this companies products, especially the ones that are rose scented. These bar soaps are great for the shower or on a bathroom sink in a cute tray. 4. 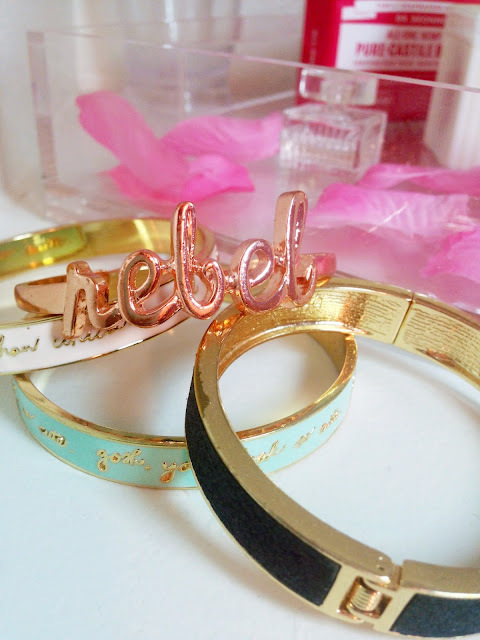 Bracelets- I love bracelets but I can't wear them because I work on a computer all day and end up putting them off to the side. They're cute when I want to hang out with my friends but wearing one of them everyday is a no-no. When I saw these at ban.do I kinda lost it though and needed to have them. I was also in my breakup shopping binge so I had to have them even more. I'm glad I snagged these when I did because they're no longer being sold on the site. While the colors aren't all pink or rosy I think they add a nice touch. 5. 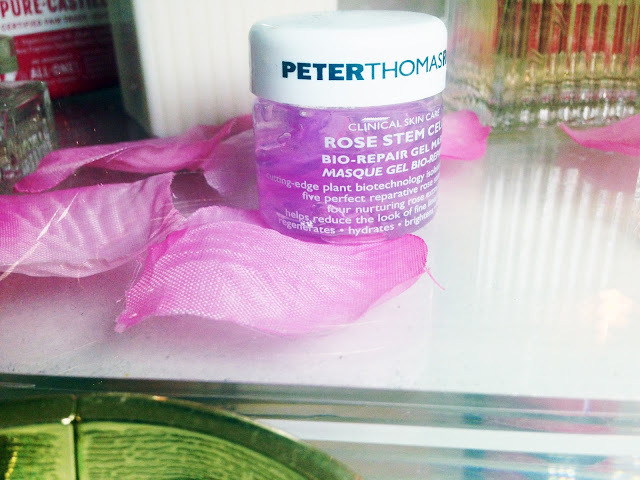 Peter Thomas Roth Rose Stem Cell Face Mask- I had this for almost six months before I actually used it because it was an impulse buy. Once I got into the scent of roses I decided to give this a try. Not only do I love how hydrated my skin is the scent is heavenly. I like wearing it overnight sometimes in lieu of my retinol cream just to change things up a bit. There you have it! I've already started on my lavender shelf but I'm still searching for more products in order to consider it complete. I also have others that I want to create themes for because I think only having two out of four isn't going to work so keep an eye out for the rest!